Nonprofits are inherently personal. The entire purpose of your nonprofit is to serve those in need, which alone draws on peoples’ emotions. Moreover, working to gather support, you have to ask people to give you their time and money, another quite personal issue. Despite this, many nonprofit brands can feel like any other big company – distant and impersonal. If not involved in your nonprofit already, a potential supporter or user of your services could easily overlook the wonderful people on your staff and the heart behind your organization. 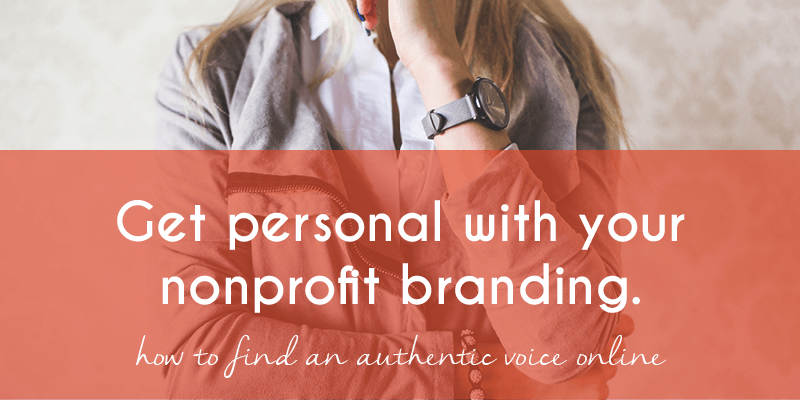 How can a nonprofit brand feel personal and authentic? The first step we take with virtually everything we do at ArcStone is to understand who our client’s audience is talking to and why. If you can’t answer that question, you won’t be able to write content or design visuals in a way that will appeal to those you need to reach. Start by walking through the first six steps of this infographic. It will help you answer some crucial questions about each of your audiences. Once you have an audience persona or two assigned to each of your different audience types, walk through the following steps. 2. Put yourself in an outsider’s shoes. If you look at your nonprofit branding with the eyes of these personas, what do you see? Does your messaging feel like it’s coming from the real people at your organization or does it sound like what everyone else is saying? Do your social channels sound like conversations with followers, or are you just posting like a robot? How clearly does your nonprofit show the people and heart behind it? 3. Speak directly to real people. Once you know who you’re talking to and how they might view you, you can speak to all of them more effectively. If you did a good job of mapping out your personas, you should be able to think of a real-life example that represents that persona and write as if you’re talking directly to them. Throughout your website copy and blog, have content for each of these personas. Your donor section should speak to donors, your blog post about a volunteer event should speak to volunteers. 4. React and communicate authentically. If possible, find people from your nonprofit that can post your blog content and share your nonprofit’s news on their social media accounts. If the content is coming from your team members, your nonprofit can better show your audience that real people care. You’re not just a large organization always asking for money. It’s true that not every nonprofit team has enough bandwidth to assign a team member to each persona. If this is the case, make sure your main goal is to speak authentically from your nonprofit’s pages. Don’t just post messages about what everyone else is saying, but rather speak with truth and emotion. Another huge step towards authentic branding is to avoid scheduling out a bunch of dry social media posts. Share your stories and content as if you’re talking to one individual rather than blasting the message out to the social world. If people interact with you in comments or messages, make sure to respond in a timely manner and to be thoughtful with each response. Show them you care and it’s far likelier that they’ll care about your nonprofit in return. A bonus step would be to cultivate brand ambassadors which we talk about thoroughly in this post. This gives you more authentic voices interacting for you, and in the long run, could save you time. Think about it: the brands that make us happy and show personality, are the ones that stand out to us. As Pierre Chandon, a professor of marketing at international business school INSEAD put it ““A brand that creates emotional joy is a rare thing” (Forbes, “The Happiest Brands in the World“). Attending a social media event at The Social Lights this past month, this message of authentic joy was strong. As we spoke about at the event, if you are happy doing your work, and your main goal is to show that passion, people will gravitate to it. You won’t have to worry about your messaging and branding as it will develop naturally. Still need some inspiration? I suggest looking through the “10 Nonprofits Employees Love to Work For.” You’ll see some pretty happy nonprofit employees and branding that portrays this. Across their social channels, they post messages as if they are your friend, just trying to keep you updated about the issue. Isn’t that what your should be?